There are so many theories on saddlepads and saddleblankets that we could write a 200 page book, without pictures! Being cowboy types, we like the idea of having whatever pad you need on the bottom and a nice Mayatex Navajo blanket on top. By doing this, we can interchange colors quite easily, so that we match whatever we need to match in the arena, without making traumatic changes to our equine's back; or our saddle fit. If we are at a 3 day show, we need 3 color changes that all complement the horse and rider. If we are at a team penning or all day roping, with a couple blankets and pads, I can keep any animal, and my jeans' legs, and our overall appearance fresh by removing the bottom pad if it becomes drenched with white foam. By doing this we save some life in both pad and blanket. Some riders prefer to layer blankets rather than to use a pad on the bottom. Some riders prefer to sandwich a pad between a larger style blanket. Some riders sew a large blanket and Velcro the rear to help hold a filler pad in place. See, told ya there are lots of good ways to enjoy protecting your horse and saddle. Wear leathers are an option on most Mayatex blankets. Wear leathers become more important, the rougher your equestrian sport happens to be. The leathers take the beating that your woven fabric would have endured. There are basic wear leathers for great protection, and tooled leathers for the show ring. Cultured Cowboy will be tickled to add a horsehair tickler, or Montana Silver Conchos to your saddleblankets. You can see the Montana Silver trim by clicking here. Just let us know light or dark on the horsehair tassels. 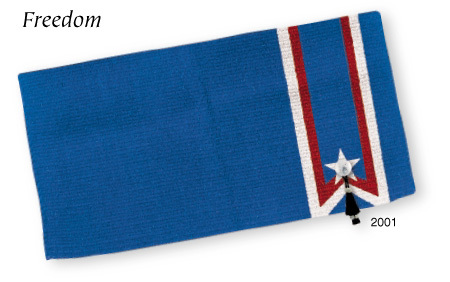 Mayatex is offering custom Embroidery now. Get your sponsor, your farm, your brand, your identity in front of others in a subtle manner. Cultured Cowboy knows there are different needs that require a variety of blankets. Whether you need a thinner saddle blanket to color up, or a thicker saddle blanket for adequate protection while pulling or roping, we're proud to help you find your best choice. 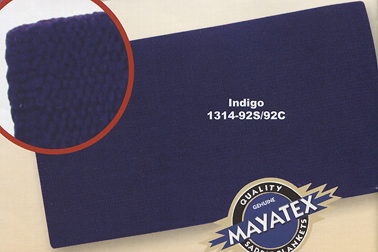 Mayatex has upgraded the quality of their acrylic blankets - more wear resistant, but still not as gentle on your horse as Mayatex New Zealand Wool blankets. Priced each, you can save $$$ in quantities. New Zealand wools are the best for immediate contact between saddle and horse, but they require more care than synthetics. Simply clean off the mud and grit, and briars, if any, between rides! Don't let it cake up. Cultured Cowboy cheats...we offer them all, in a variety of sizes and styles! Cultured Cowboy has a large selection of blankets with more always coming in. If you don't see colors you are looking for, give us a call toll-free at 1(866) 4 926 926 or e-mail us. If your choice is not in stock, we will do our best to get it for you. If you have an Arabian, check out our Arabian Saddle Blanket page. 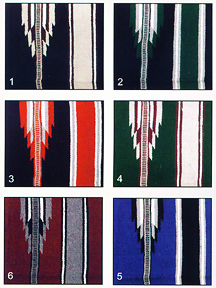 To choose your own colors, Cultured Cowboy offers Custom Saddle Blankets. Also be sure to browse through Cultured Cowboy's complete selection of Pleasure, Work, and Show Saddles & Tack. All are accessible from our home page www.culturedcowboy.com under the Horse and Rider subheading. Note: This page has so many images, if the Internet is running slow today, please hit your "refresh" button and the images will come on down. You may have to hit "refresh" several times for all images to appear. The approximate download time is five minutes on a 33.6 modem, so you may decide this is a good time for a coffee break but we feel you will find our selection is well worth the wait. ( It's only seconds on DSL) We try to give you plenty of info to help you to make an informed decision on your purchase while you wait. Thus, all the free advice. Saddle Blanket Care: Hand wash your best blankets in cold water. Use your fingers to work your water through the fibers as needed. Washing machines will tear your investments all apart! If you must use a detergent, use a very mild dish detergent, (Dawn dishwashing or Woolite), or the same mild shampoo you would use on your hair. Rinse with cold water. Using salty water will help set the colors on your brightest colored blankets. On show blankets with wear leathers, use much caution not to get the tooled wear leathers too wet. Tooling will dissipate when soaked. Dyes will bleed onto each other. SPOT WASH only what is dirty. (Use a bottom liner under you blankets to reduce sweat and grime.) Cultured Cowboy has TackyTack, and Mayatex and Supreme and Reinsman liners, any of them can be trimmed to fit your needs. Use Lexol on the wear leathers after cleaning to recondition your leather. Keep your leather conditioner at least 1/4 inch from the edges of your blanket's woven fabric. The conditioner will bleed into those edges. If you get too close, you can cause the leather's dye to bleed onto the woven fibers. If this happens, it will never come back out. Take your time. NOTE: If you are using your blankets directly on the back of your horse, rather than with a bottom liner pad, Mayatex advises that even soaps made for fine wools can have surfactant residue left within the fibers. This surfactant will show itself at the next heavy sweating. On barn blankets, bottom blankets, or really every blanket, unless it really gets filthy (stinky): I'll rinse them off with a water hose and hang them over a wooden rail to dry in the sun. I can brush off the excess hair from Spring shedding with the same medium to soft horse brush or rubber curry that I use on my horse. If they get really muddy, use a pressure sprayer on your hose. Stand back & squirt! Pressure washers can damage the fibers. If it'll get down low enough use it, but be careful. 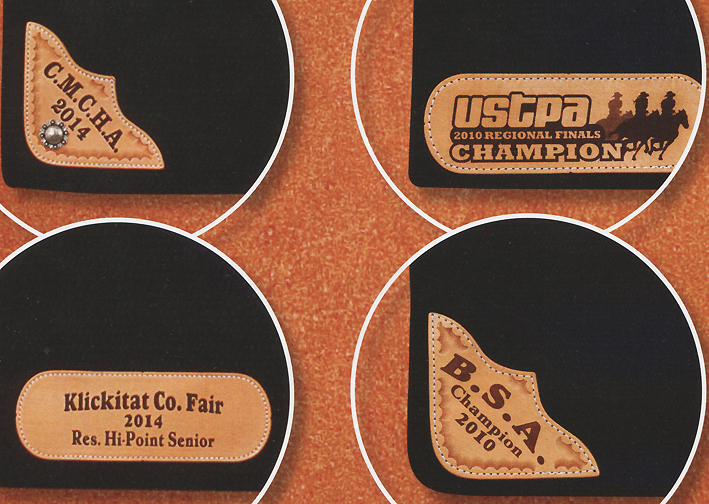 For more Info Click Here to the Saddle Blanket Care page. 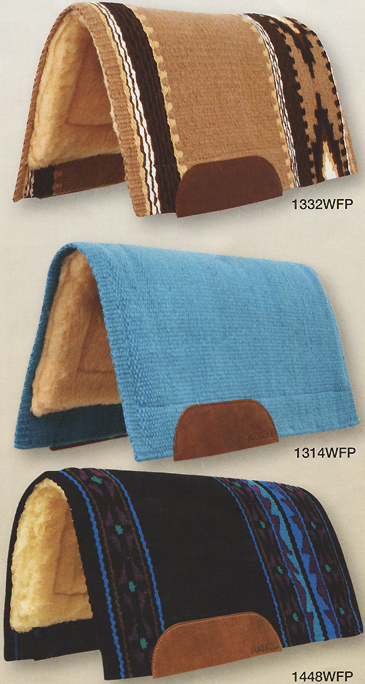 Yes, you can add your own wear leathers to your favorite saddle blankets you already own . Get a chap type leather. Cut to the size you like. Allow about 1/2 inch below the blanket edge for best protection. Extend from front to back more than the stirrup and tie strap will affect. You can get a good heavy thread, and pre-punching holes in line with an awl or ice-pick, about every 1/4 inch, then hand sew through it all. Any more questions or comments? The answers might end up on this page soon! It is the answers to your questions that we use to make these comments. Let's start this page with a good economy blanket. 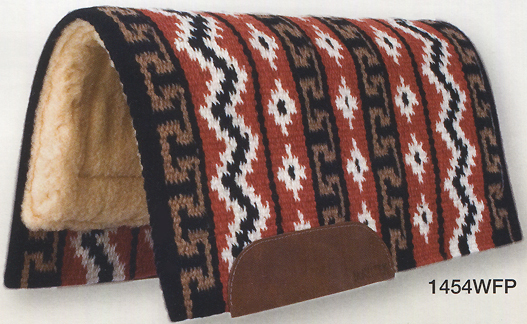 The Mayatex Ranger 2000 saddle blanket is a good 30 x 60 inexpensive all around woven blanket. You can enjoy 12 popular colors. Use alone or layer several blankets as needed. Use them over the back of your couch or easy chair, or hang on a wall for home decor. Sew them together for pads, or pillows, or tote bags or purses. Acrylic Weft / Synthetic Warp. Tightly woven in bright colors. We have found that you can double this blanket off center for a longer length. Just keep it doubled under the bars of your saddle and you keep the protection you need. OK, we know this blanket name can be confusing... The style number is 1320. The size is 30 x 60. 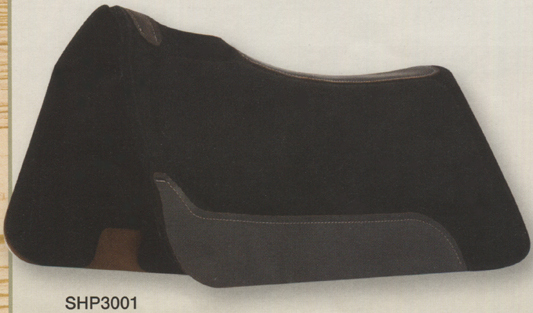 The saddleblanket is named the Ranger 2000. Choose your colors from the 12 color palates above and above left. An oversized 36 x 34 economical blanket. For 2018, Mayatex improved the acrylic fiber fabric, and the weave so these solids look cleaner than ever before. They have a much more wool looking appearance & feel than the older 1330D. (Not so much separation between warp & weave now.) They wash better too! The Mayatex Trail Boss Solid is offered in 5 solid colors. Enjoy several popular colors. Use alone or layer several blankets as needed. Use them over the back of your couch or easy chair, or hang on a wall for home decor. Sew them together for pads, or pillows, or tote bags or purses. Acrylic Weft / Synthetic Warp. Tightly woven in bright colors. Great for art projects. With these Ranger solids, you can have a pair of stamped wear leathers added to your horse blanket. 3 lbs weight each. An economical horse blanket that is both washable and durable due to a tightly woven construction of acrylic and synthetic yarns. Trail Boss Solids are available in the following colors for your coordinated look: 18 - Black; 19 - Cream; 2 8 - Red; 29 - Purple; 31 - Royal Blue. An economical horse blanket that is both washable and durable due to a tightly woven construction of acrylic and synthetic yarns. Just a little heavier yarn than the Trail Boss. 4 lb weight. 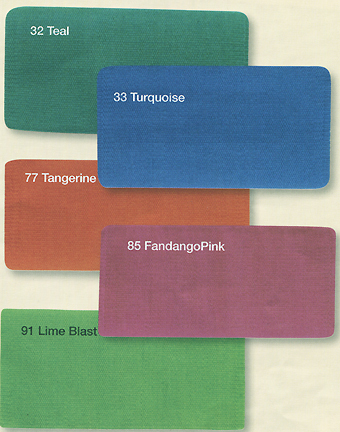 32 - Teal; 33 - Turquoise; 77 - Tangerine; 85 Fandango Pink: 91 Lime Blast. An oversized 36 x 34 economical blanket with a most popular pattern. 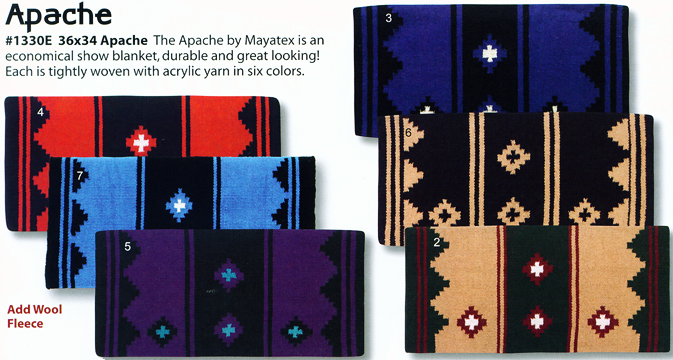 The Apache blanket by Mayatex is an economical acrylic show blanket. Durable and great looking. Tightly woven in your choice of 6 colors. Your saddle pad now includes the Haymaker blanket with a heavy felt center, 100% Ultra Soft Wool fleece and Top Grain Wear Leathers. Independently recommended as the best " working cowboy saddle blanket " for the money. A thickened and oversized 32 x 64 working horse blanket. This blended acrylic fiber and the especially tight weaving makes this saddleblanket last and last. Durable and with a timeless look. Your choice of 12 colors. Our CC Price Only: $15.99 pr Add -STDL to your Ramrod Doubleweave blanket selection and you add a pair of these high quality top grain chap weight brown wear leathers. (Color may vary) Enjoy the extra protection. This leather is an asset for all riding disciplines. Our CC Price Only: $24.99 pr Mayatex Wool Saddle Blankets can also be ordered with premium wear leathers which angle upward fro some protection on the tug straps connecting your saddle to your breast collar. The rear extends further back to take care of the flank set as well. For additional style, add a Montana Silver concho and/or horsehair tassel! You can see the Montana Silver trim by clicking here. Just let us know light or dark on the horsehair tassels. An oversized 36 x 34 economical blanket with "out-of-this-world" color! 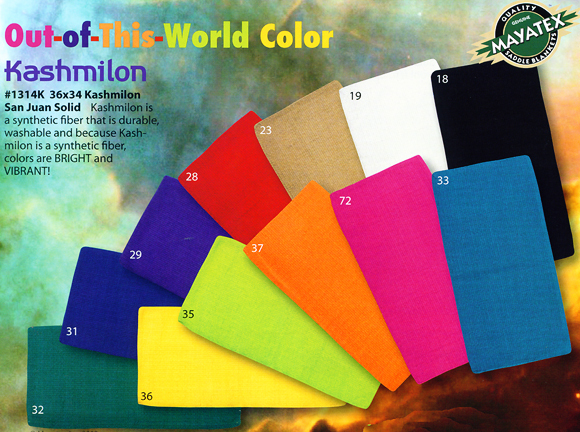 Kashmilon is a synthetic fiber that holds vibrant and bright color. An economical synthetic show blanket. Durable and washable. Tightly woven in your choice of 12 colors. For those who demand perfection, Mayatex San Juan 100% New Zealand Wool solid horse saddle blankets offer a a flat "no-curl" hem at the edges. (See Insert below) San Juan solid blankets come in a standard show skirt size, Style # 1314S, of 36 x 34. Or, the oversized, Style # 1314C 38 x 34. Each blanket color is marked with the size(s) available. (S for 36x34, C for 38x34) San Juan Solid saddle blankets are a step toward natural, with all the wonderful wicking and cooling properties of woven woolen blankets. All wear leather choices are available on the standard and oversized San Juans. There are San Juans in the Arabian, and Pony pages of our saddleblanket website too. From show blankets to trail blankets, the San Juan is one of the most versatile, good looking, woven saddle blankets made in this world. The Inset (left) shows the quality of the yarn, and tightness of the weave you can expect in your San Juan Show blanket. Mayatex yarns and skills are so good, that many other makers of saddle pads, and woven products, will use nothing less than Mayatex quality to finish their patented products. The solid wool colors Mayatex offers will complement almost all makers of show clothing, and almost all other complementary tack and such. Designers in the equine industry work hard to coordinate together so you will look your best. Choose your color. Choose your Pattern. (Wear leathers shown in Ranger Solid Section above) Price includes blanket with sewn on stamped leathers. 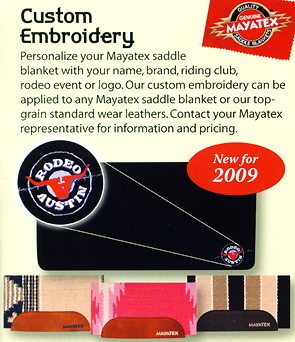 Personalize your Mayatex saddle blankets with your name, brand, riding club, rodeo event, logo, insignia, or award, on Laser Engraved Corner Plates. 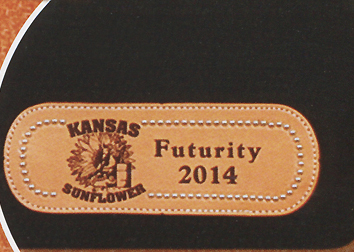 Laser engraving is also available on Private Label Standard Wear Leathers too. (Laser engraving begins at the rear of the wear plate and goes forward.) Contact Cultured cowboy for more information. If you have your "mark" we can place it on your "Trophy Blanket". Filigree Wear Leathers - Filigreed hand tooled leather wear leathers are made from fine carving leather. Carved and tooled by master craftsmen. Available in either acorn or floral tooling. Light oil finish. Available with 3 piece detail as shown with concho and horsehair tassel, or as a 3 piece tooled border, leather only. (Filigree means with the cut outs to add depth and excitement as well as protection to your show blanket.) Pricing below is for a pair of wear leathers added to the price of the blanket of your choice. 3 piece pattern with silver concho and horsehair tassel. 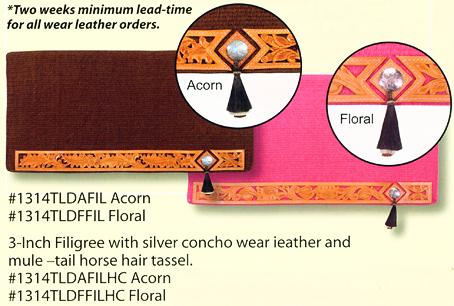 Custom Embroidery - Add personalization to either your saddle blanket or wear leathers. 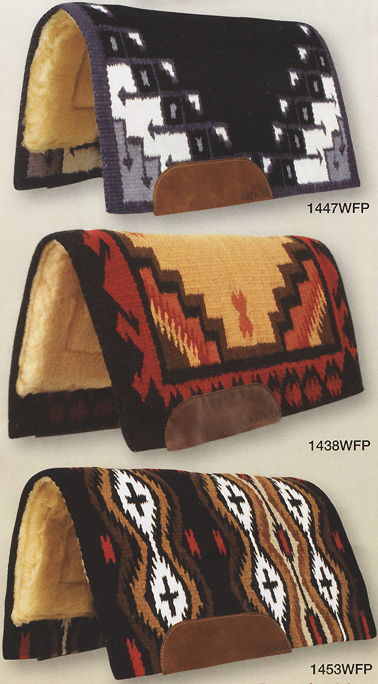 The 34x30 Wool Saddle Blanket can also be ordered with customized embroidery. Embroidery is done in three stages. 1) Design. 2) Digitizing the design into a thread pattern that works. 3) Stitching. If you have your design, you can send it to us and we can get it digitized for you. If you already have a design digitized, that can be sent to Mayatex and returned with your blanket. Design and Digitizing are one time fees. Once done, unless there are changes, you can repeat the custom embroidery on other blankets at a nominal charge for set up and stitching. Just because of the nature of art, we have to have your logo at least "sketched out" to be able to tell you an estimated investment for this service. Initials embroidered in a standard font style do not have the digitizing fees. 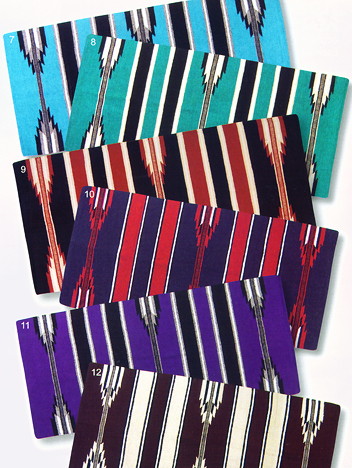 USA Saddle Blankets - Great for rodeo or drill teams! Show your colors with this great design - a real favorite of rodeo riders everywhere! 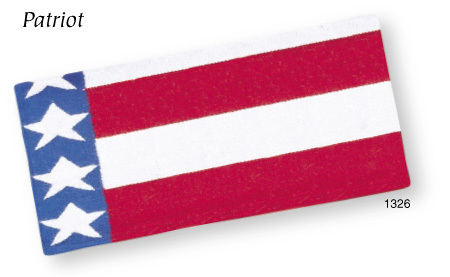 This "Proud to be American" patriot design is popular with all ages. New Zealand Wool. America. Land of the free, home of the brave. New Zealand wool. (Can be fitted with dyed leather star, silver concho or silver concho with tassel at a nominal extra charge.) This "Freedom" blanket has adorned several grand entry and parade groups. Made only by special make-up, with a minimum of 6 blankets. This can be a Favorite for groups in formation exercises. 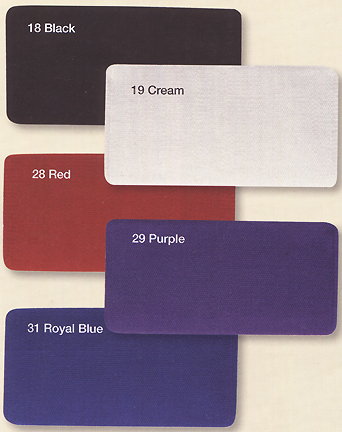 Made of the highest quality hospital felts, these pads are the perfect companion to your saddle blankets. They keep your blanket cleaner while adding cushion comfort between your saddle and horse, and if you blow your breath through the fibers, you will feel how well air circulates to your horse's back. You can feel your breath on your hand as you hold it. 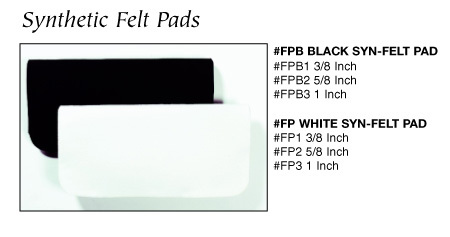 Due to the nature of the felting and atmospheric or shipping conditions, these pads may vary 1/16" from the designated thickness when they arrive. Yes, all pads will absorb some shock. These shock absorbing pads are designed to dissipate more than most. Choose from all synthetic felt 1/2 inch, or 2 layers of felt, sandwiched over a neoprene center. The thinner pads absorb shock in a closer contact method. The thicker pads are usually better for longer periods of work. We use a lot of different pad/blanket combinations, depending on fit and purpose. If you have questions, just holler our way via phone or email, and we'll give you the best answers that have worked for our customers and through our experiences. SHP3001 32 x 32 Synthetic felt economy contoured felt pad. 1.2 inch of synthetic hospital felt with a contoured cut back. Wear leathers to protect against wear points are sewn in place. Black. For more selections of synthetic Performance Contoured Pads, Click onto the Mayatex SaddlePad page. 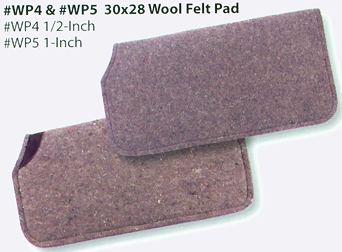 WP4 or WP5 30 x 28 Gray wool felt pad. Barrel Racer sized. Choose from WP4 1/2 inch or WP5 1 inch wool fiber felt thickness with leather gullet. Heat and sweat help custom contour the back centerline to your horse. Top grain roper type wear leathers. 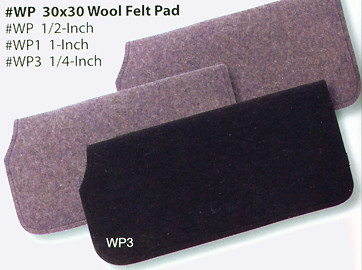 WP or WP1 or WP3 30 x 30 Gray or black wool felt pad. pleasure/roper sized. Choose from WP 1/2 inch or WP1 1 inch wool fiber felt thickness. Heat and sweat help custom contour the back centerline to your horse.